A bit over a year ago, I had the opportunity to review Kinderbach after using it for a couple of months with my kids. As part of the TOS Homeschool Crew, I had the chance to work with Kinderbach again this year. Basically, Kinderbach is a series of online music/piano lessons, using some great little characters. The kids are learning some musical theory, they are learning where the notes are on a real keyboard. While it is video based, the program does have the kids taking a very active part. You do need a piano or keyboard. Like last year, my kids love using it. And I got them all involved in it. Connor (13) did almost all of the teaching, with William (12) and Thomas (10) doing some coaching for Richard (7) and Trina (5). They all learned from the program. Currently, there are 60 weeks of lessons available, divided into six levels of ten lessons each. A seventh level is in progress and will be available soon. Since we had done this a year ago, we went ahead and started back over at the beginning, but we did a "week" of work in a day or two for the first little bit. As we got further, it wasn't that my younger children couldn't continue the lessons that fast, but it was much better to allow some time for the concepts of that week's lesson to sink in. There is a very short introduction video that explains what you'll be learning that week and what types of supplies you need. Then there are four sessions to the lesson. Session 1 opens with Karri in a hand-drawn environment (she's real, she interacts primarily with "cartoon" settings and characters) creating a matching game with the characters and letters for C, D, E and F. There is also a short song, and then Karri comes back to explain how to play the game. My kids pretty much grasp this already, so they watch the couple minute video, play the game and move on. Session 2 has you looking at scenery, hearing some basic music patterns, and then coloring the patterns on a coloring sheet. Anytime there are workbook pages to go with the session, the little printer (with a red slash in the image above) is clickable, so you can print only what you need that day, or you can download all the printables for the level and have them printed up in advance. You can see the music looks kind of like real music, but not quite. I think it is a fabulous transition for kids who are too young to be completely successful with reading "real" music, but certainly ready for the hands-on and FUN experience of playing their own song. The big thing is that this is teaching them the patterns. Notes going down, notes going up, or notes staying the same. 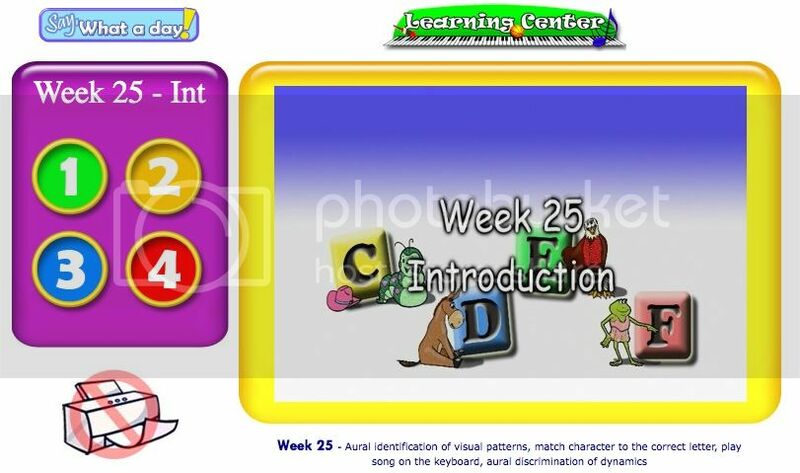 We end up watching the video a couple of times so that the two younger kids both really get the differences between the patterns, and everyone spends time practicing the two-page song. And that is where we stop for the day. Session 3 is a fairly lengthy video on the terms piano (quiet) and forte (loud). This includes a game where the student colors different fish bowls depending on whether the sound they hear is piano or forte. I love these activities for my 5 year old especially. My older guys roll their eyes a bit, but the thing is, they are grasping the concepts too. Next day, we do Session 4. This one has to do with discriminating notes of different lengths -- eighth, quarter, and half notes. So a song is played, then the student gets to practice it, and then there is more work with listening for patterns. This is another lesson that my younger two need to practice, so they work on this more for the day. All told, this lesson takes us three days, and since I'm not real hung up on starting on a Monday with a new lesson, we just keep moving to the next lesson. We're probably able to do roughly three lessons over two weeks, once we got past the beginning parts that my kids remembered from last year. My opinion? I love this program and really want to subscribe. 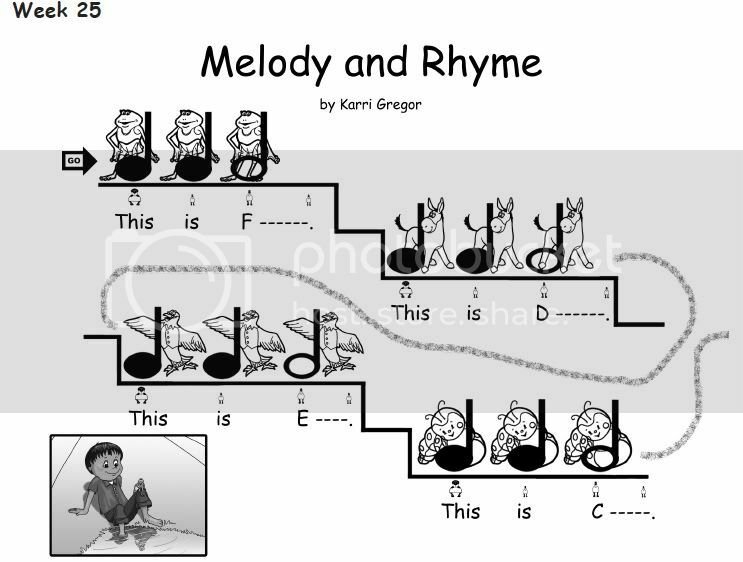 I think that much like some of the pre-reading and beginning reading programs I've been reviewing lately, this program does an excellent job of laying a solid foundation of ideas and concepts that a student will need if they are going to go on to play piano, sing, or play another instrument. You can try out the first two lessons for free, but I don't think these really give you a solid feel for how the program really works. Online subscriptions are available for $95.88 for the year, or $19.99 per month. Disclaimer: As part of the TOS Homeschool Review Crew, I did receive access to Kinderbach for three months. The fact that I received complimentary products does not guarantee a favorable review. It does guarantee a review. A fair review. But I am not going to praise something unless I think it deserves the praise. If I don't like it, you'll hear that. And hopefully with enough detail as to why so you can decide for yourself if what I hate about it makes it perfect for your family. For more about my take on reviews, visit my blog post here. Very good review. MY son loves Kinderbach. He says we HAVE to buy it for him. I think he thought he better not make it sound too expensive or he may not get it.